We've reached the middle of May, I seem to say it almost every week but where is the time going?? This week has been filled with sunshine, laughter, milestone moments and a few lovely deliveries and some of those things were actually for me which makes a change!! Layla has finally learnt to drink out of a "big girl" cup and Gracie has mastered writing her name and Freya went in the golden book twice this week for doing so well with her writing at school, I just need Elise to lose one of her wobbly teeth finally and it will be four for four. I do question Elise's taste in clothes sometimes, apparently she was being a model here. 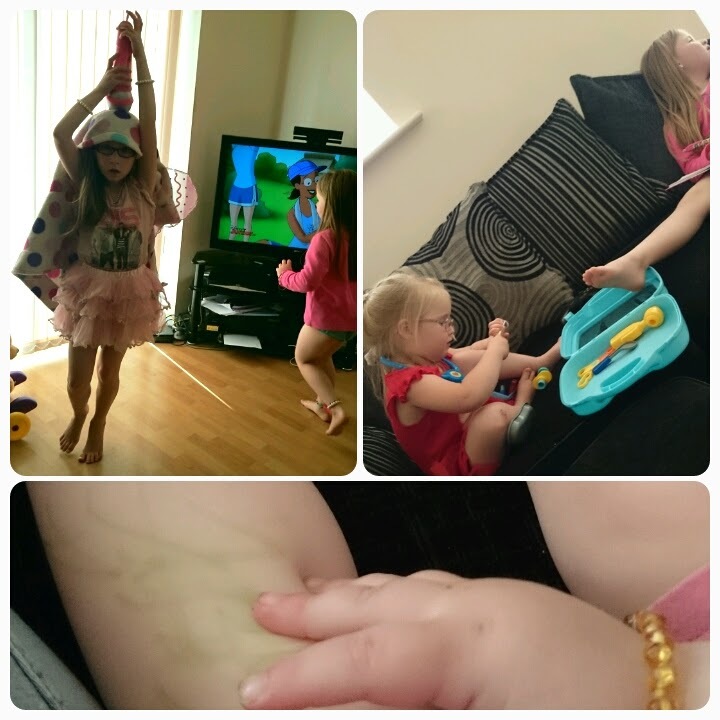 Doctor Gracie to the rescue once again, looking after Freya's poorly leg and Layla was caught drawing all over herself, if it isn'y herself, then it is on the books, atleast I can wash it off her!! I love seeing Gracie and Layla getting along as more often than not they pair off with their other sisters. Freya was more than happy to pose for the camera whilst Elise was more happy trying to hide from the lens. Gracie was getting to grips with her new LeapReader, Freya obviously had a hard day at school as she spent the rest of her day lounging on the sofa. 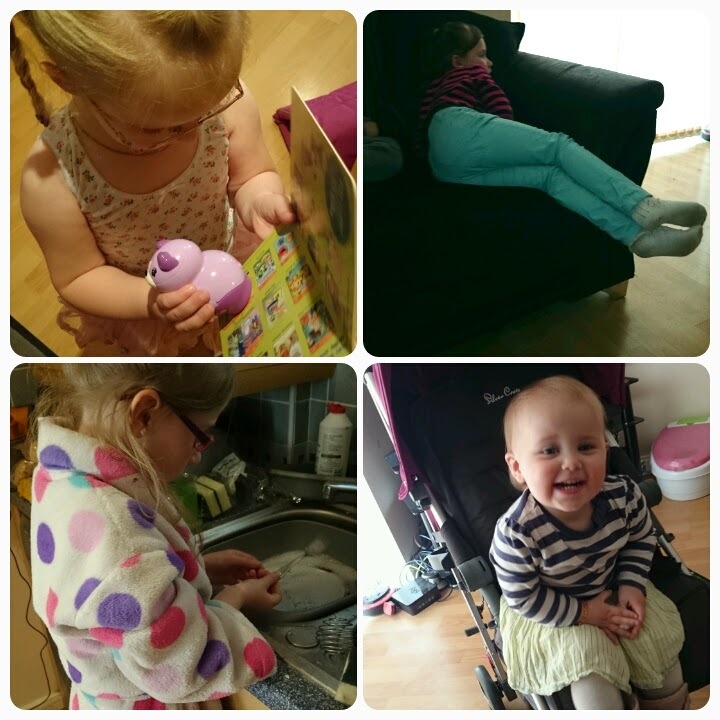 Elise was being her helpful self and did the washing up (lucky mum) and Layla was busy trying out her new pushchair. 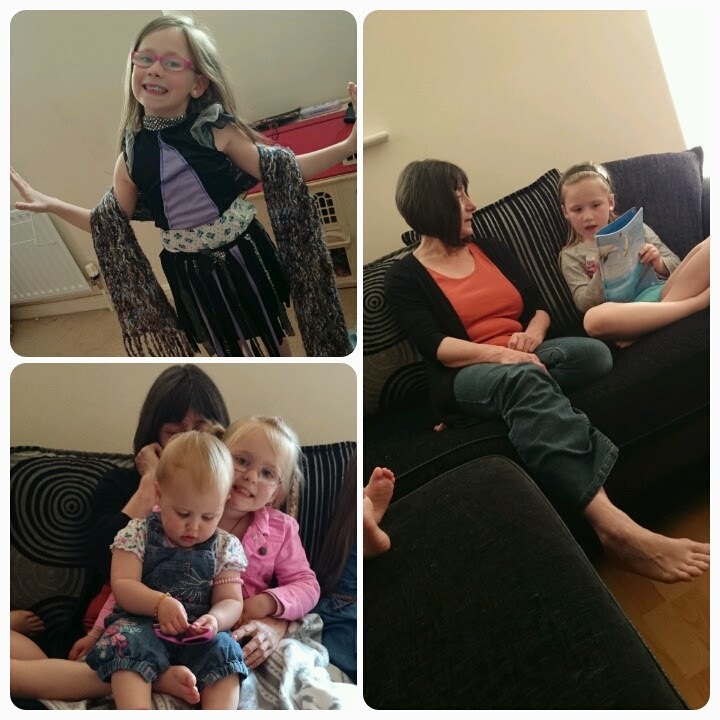 Wednesday is the day my mum always comes to visit so the girls are generally glued to her side, well all of them except Elise she was quite happy to go off and dress up whilst waiting for her turn to have cuddles with nan. A gloriously sunny day, yay. After school Elise was exploring the bottom of our garden, searching for insects. 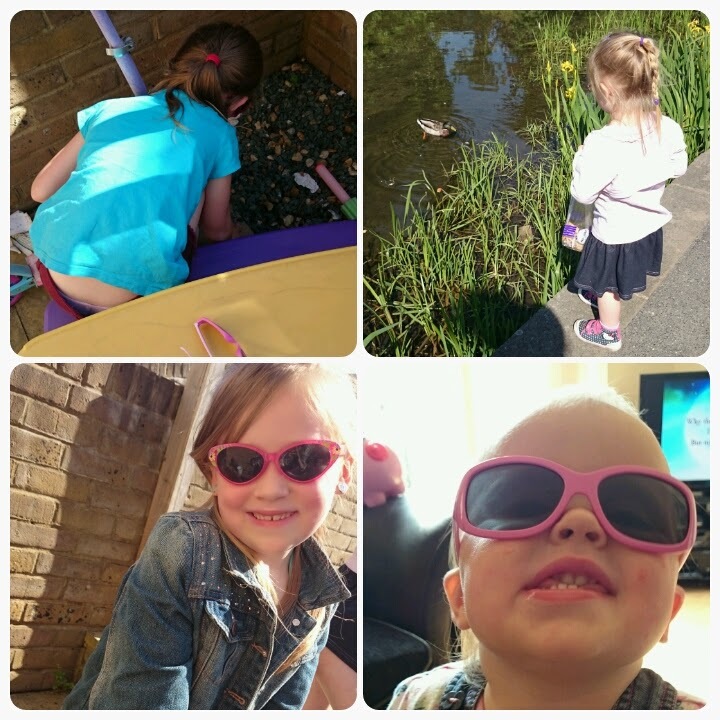 I'd taken Gracie to feed the ducks earlier in the day and Freya and Layla were looking very cool in the sunglasses, although Layla's glasses are tad too big. 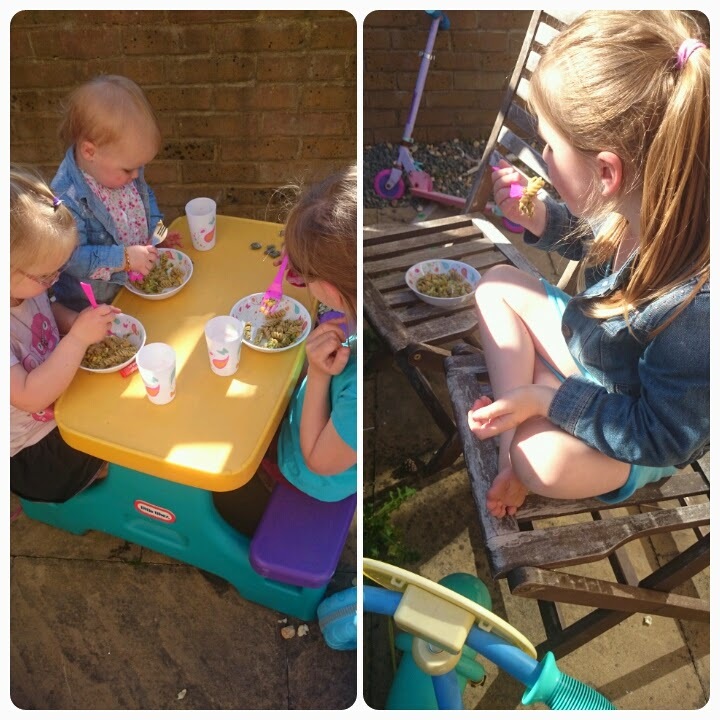 Another sunny day so the girls were able to eat their dinner outside. Freya decided to not join the others and use a chair as a table instead. Freya asked me to take a picture of something she drew today, mummy forgot to take the flash off, opps. 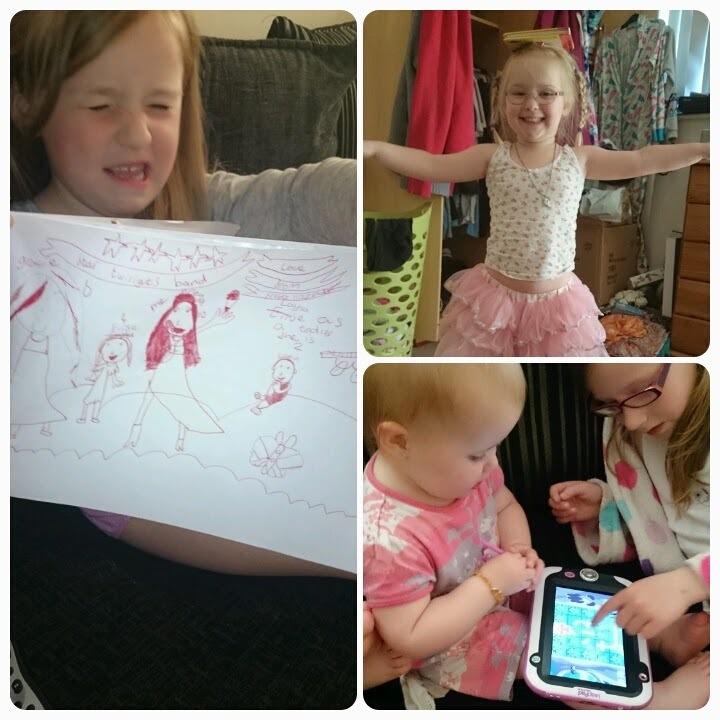 Earlier this morning Elise was trying to teach Layla how to use the LeapPad, the word gentle was repeated often!! Gracie was showing me how she could balance books on her head. Lovely pictures of your girls as ever. I love that you capture all of them every day. she has lost them already the little monkey!! Loving garden picnics and sunglasses. Lovely round-up Chantelle, it looks like you've been really busy, and congrats on your girls' little milestones this week. Nanny cuddles are the best i love the fact that wednesday is Nanny day in your house so lovely!! Lovely to see them enjoying the sun. Those sunglasses are absolutely wonderful, so very glamorous! Good to see you have a body artist too :) Love the photos with the sunglasses. nice to see so many sun themed pictures this week. Lol at the repetition of "gentle" , dont think they know the meaning of that quite so young. We used the table outside last week as well. 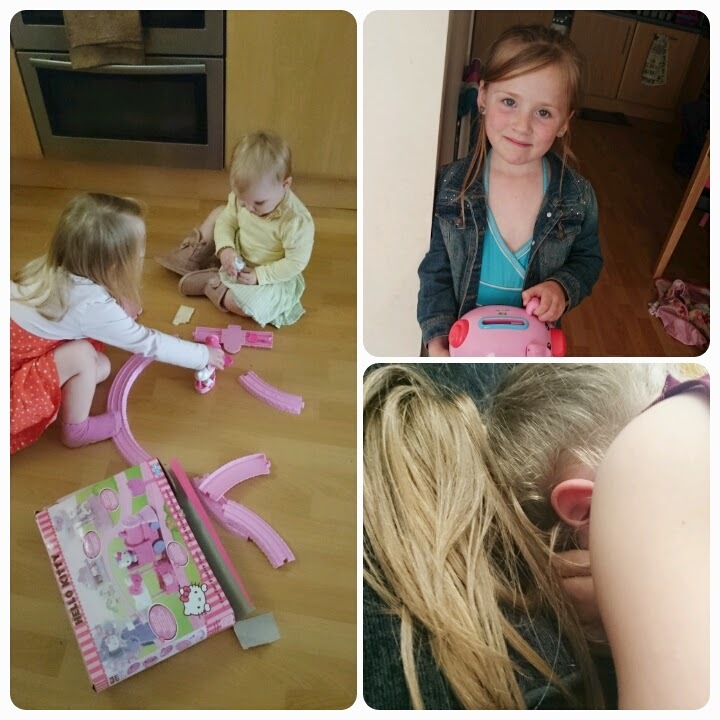 no what you mean about the toys, was a present from their auntie, its hello kitty so apparently that means pink!! Wasn't it lovely to have the sun out? I love getting outdoors with our grandson.